Tonight was one of those times. Our horses know the routine. We head out to the barn. Everyone goes in their stalls. Food is distributed. Love and neck rubs are given. Stalls are scooped. This is not a new event, but tonight you would have thought I was asking them to barrel race at the rodeo. For starters, Sweet Suzy Q took off running, which only caused everyone to take off into the pasture as well. Again like the kids, one can sure wind up the bunch. Once we settled and determined that a lion wasn’t chasing anyone, we slowly worked our way back to stalls. But still no luck. Tactic number two – a bribe. Off to grab the food and see if I could coax them into place. The thing with a thousand-pound animal is that you just can’t drag them by the arm and stuff them back under the covers. Success! Food worked and Suzy and Ranger were tucked neatly in their stalls munching away. Now for Smokey, my resident jumpy pants. The little jaunt into the pasture (thank you Suzy) had him on edge. Snorting and blowing he followed me into his stall. Ears perked at every noise. Gates swinging, doors opening. It was like he was new here. He settled into the goofy pace of eating and going to the end of his stall to check on things and then back to the food. Whatever works for the big fellow, the bottom line was that he was in. And finally there is River. You would think the horse had never seen a stall in his life. And to make matters more amusing, the donkeys kept right on my tail as I tried to talk and coax River into his stall. You see the donkeys are last to eat, and they know it. So the longer River fiddled around the longer they had to wait. Patience is not something donkeys are experts at (please hold your shock). Here I am in the pasture, talking to a thousand-pound horse, coaxing him with food all while Sweetie Pie is glued to my backside. If you were there, you would have heard me yell at the donkeys, “Listen Thing 1 and Thing 2, back off for a minute. Will ya?” Yes, you have to talk to the animals to make it through these obstacles. Finally after sniffing, timid steps, and great leaps of courage, River made it into his stall. A collective sigh of relief could be heard throughout the farm. Funny how the sound of horses chomping hay can be music to your ears. 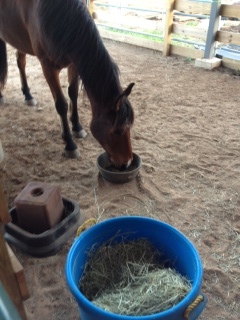 River happily munching his dinner in his stall – but not after acting like a crazy beforehand. Big hugs to you!! We will talk soon! Thanks, Tara. Glad you are enjoying it. Would definitely love to catch up. You guys are welcome to our little piece of crazy anytime! Hugs back!!! I always wait until I have nothing else on my mind so I can enjoy every word of your stories. Love them all and great for the end of the day. It may be a fun for me to read about, but not for you at the time it is happening. Thanks for giving me the pleasure of your daily life. You’ve found your calling – good stuff!! Bed time with 4 boys seems remarkably familiar to this little episode!